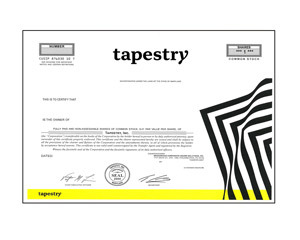 Tapestry is the first New York–based house of modern luxury lifestyle brands. The company’s portfolio includes the Coach, Kate Spade New York, and Stuart Weitzman brands. One real share of Tapestry, Inc. is a must for someone who loves luxury brands like Coach, Kate Spade, & Stuart Weitzman! Note: Coach changed its name to Tapestry in Oct 2017 to reflect its expanded offerings including Kate Spade accessories and Stuart Weitzman shoes.